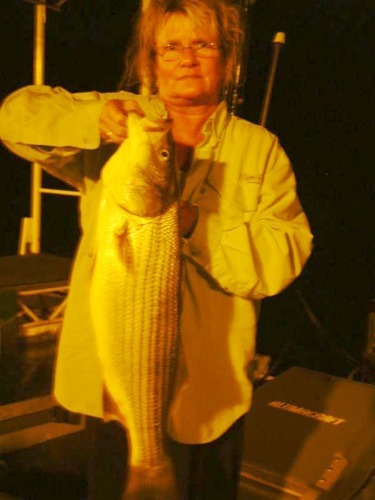 Laura definitely had the catch of the night with this nice striper. Rob (her dear hubby) did reportedly catch some very impressive rocks and a big stick… Besides this 34-incher, Laura also caught a hefty walleye! This entry was posted on Saturday, September 25th, 2010 at 11:41 pm and is filed under Fishing. You can follow any responses to this entry through the RSS 2.0 feed. You can leave a response, or trackback from your own site.